When I was a kid, every Saturday my parents would to have cookouts and invite the rest of the family (and some friends) over. Almost everyone showed up week after week – my aunts and uncles, cousins, people my parents had been friends with for years, and many of the kids I was friends with from the neighborhood. Everyone knew that during the summer, my house was the place to be on the weekends. We would eat, play croquet, volleyball, badminton, and basketball until well past dark. Those cookouts are some of the best memories I have from my childhood, and I hold them even closer since I now live over 1,000 miles away from most of my family. As fun and festive as those weekends were, I recall a distinct lack of music. That was probably 20 years (or thereabout) ago, so taking tunes outside of the house wasn't nearly as easy as it is now – hell, I take millions of songs with me everywhere I go these days thanks to Play Music All Access. 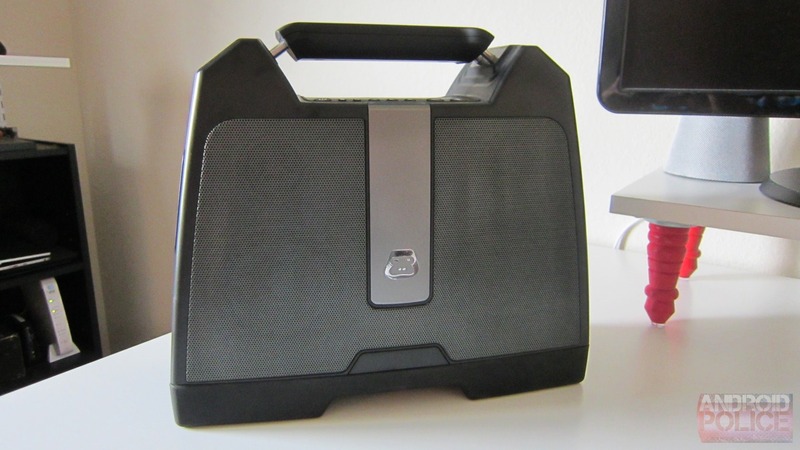 If we had those cookouts nowadays, you better believe that a killer Bluetooth boombox would be clutch in making the experience even better. 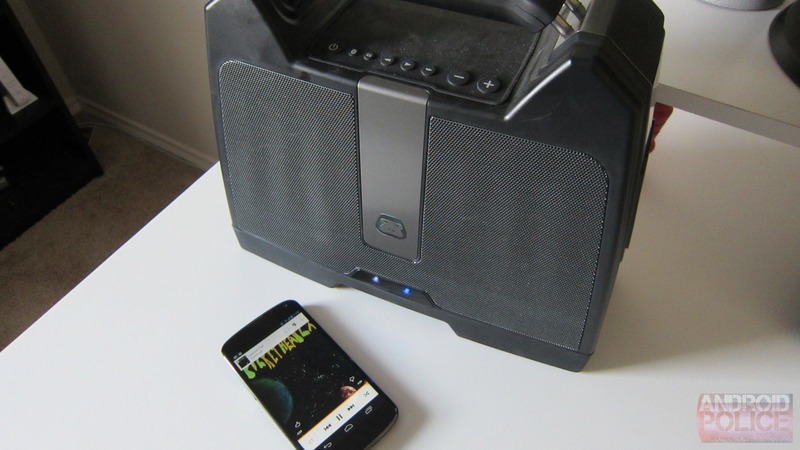 While we've reviewed many Bluetooth speakers over the last couple of years, we haven't really spent a lot of time in the Bluetooth boombox category – the Logitech UE Boombox is probably the only qualifying speaker we've taken a look at. At $250 though, it can be a tough pill to swallow for many. So after hearing about the G-Boom from G-Project, seeing its rugged exterior and $99 price tag, we had to see what it's all about. And in short, it's awesome, price be damned. Right out of the box, the G-Boom looks like something you could do some physical damage with. 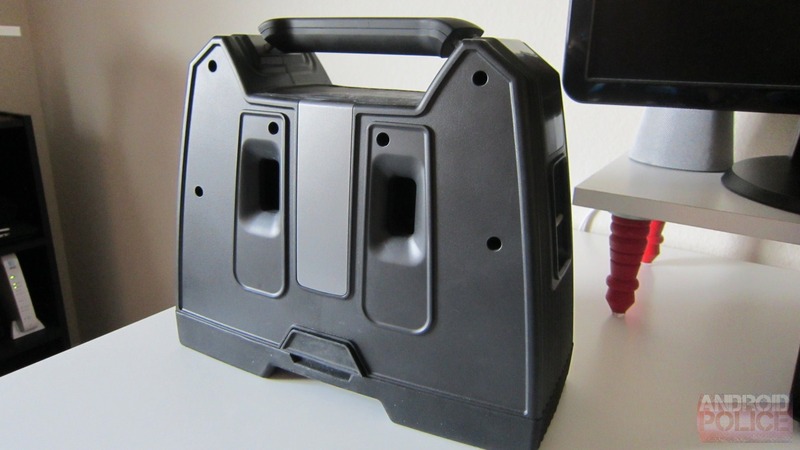 It's a mean-looking flat black unit with rugged design, top handle for easy portability, strap hooks on either side, soft silicone buttons, and massive airflow ports on the back. Just one look at this speaker and you know it means business. And then you turn it on and all of those thoughts are confirmed. But we'll get to sound quality in a bit. 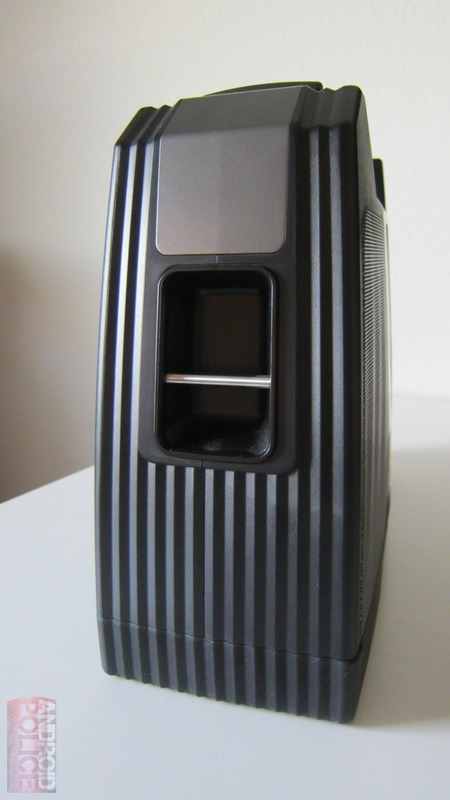 The front of the unit is essentially a wall of speakers with a trio of LED indicator lights at the bottom: power, charging/low battery, and Bluetooth connection indicator. Beneath the top handle, you'll find a row of control buttons: power, Bluetooth, EQ (! ), track control, and volume control. The buttons are insanely easy to press and have an incredibly satisfying *click*. The top and bottom of the unit are covered in a soft-touch silicon that not only makes it pleasant feeling, but also keeps the speaker from sliding all over the place as it thumps away to your favorite tracks. On the downside, that silicone also attracts and holds dusts like crazy. That's kind of annoying. The sides are virtually identical to one another: they're basically free from everything except small metal bars for carrying the speaker with a shoulder strap (not included). The back of the unit is where you'll find the two airflow holes and all available ports: charging, full-size USB (for output only), AUX in, and a little reset pinhole should any weird issues arise. 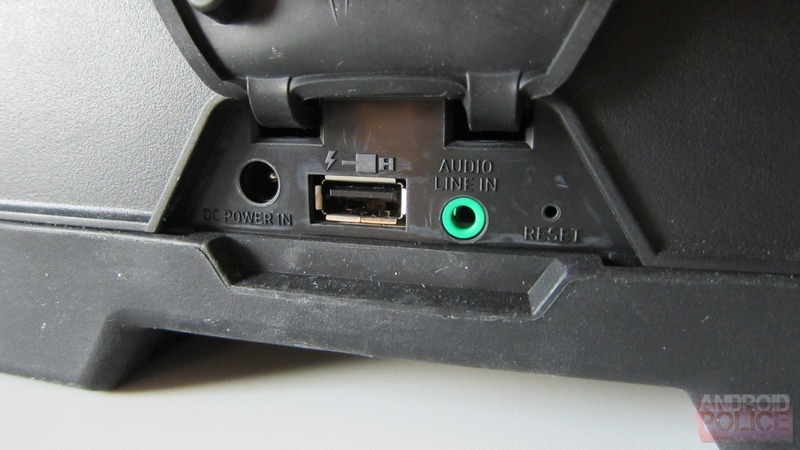 As you have probably already figured out, the USB port is for charging mobile devices, but get this – it only works when the G-Boom is plugged in. That's pretty dumb, but it kind of makes sense. Explanation incoming. As good as the G-Boom is, corners have to be cut somewhere in a $99 speaker that sounds this good. 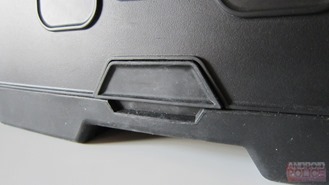 In the G-Boom's case, that cut was made in the battery. Under "normal" circumstances – let's say medium volume in a not-too-hot outdoor temperature – you'll probably get around six hours (at best) out of the battery. 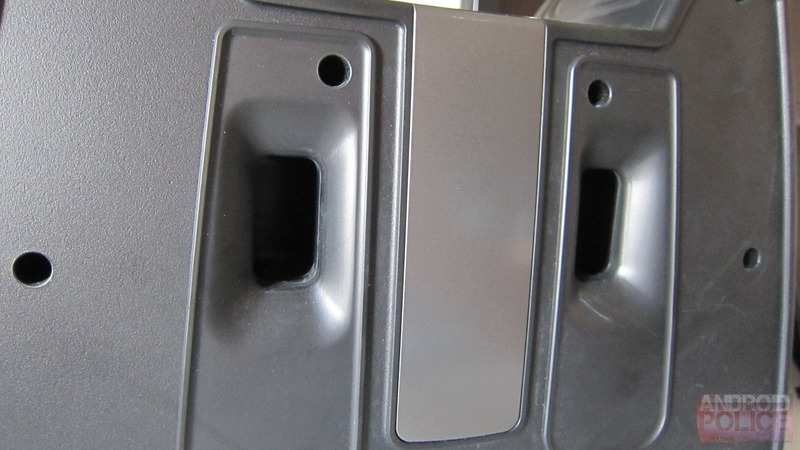 Increase the volume and/or temperature, and that number's going to drop. 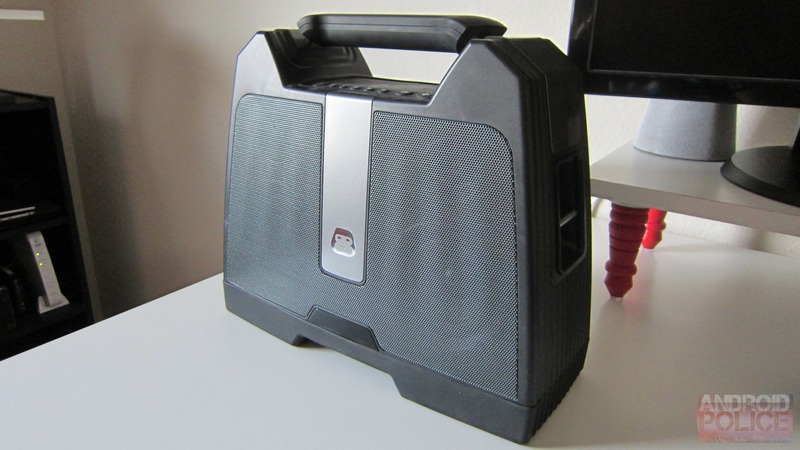 In all honestly, that's the primary downside I was able to find with this boombox – everything else about it is very good. Speaking of "very good," let's talk about the EQ. I was overjoyed to see this a feature on the G-Boom. Despite it having only three settings – flat, rock, and pop – it's nice to have some options on the table provided by the speaker itself. The EQ button does all the work here; press it and the power LED will flash a number of times according to the setting. For example, if it flashes once, that's the flat EQ, two flashes means it's on the rock settings, and three indicate it's on pop. It's easy-peasy, and each setting definitely has its own effect on the audio output. I like. I also appreciate the fact that it has track navigation controls directly on the speaker. That's an omission on far too many Bluetooth speakers, and I can never understand why. I want to be able to control the music from my device and the speaker, not just my device. If I were to put the G-Boom on a scale of 1-10 in the sound quality department, it's easily an 8, maybe even a 9. And when price is also considered, it's a 10. For $99, I can't believe how good this boombox sounds – it's comparable to speakers costing twice, or even thrice, its price. And it absolutely slaughters every other speaker within the same price range, no question about it. The low end produced by the G-Boom easily lives up to its name, but it's not overwhelming. Despite having so much oomph, the mids and highs are still pronounced and clear, providing a very balanced sound. And as I've already said, the built-in EQ helps enhance the music you listen to perfectly. Past "holy crap that sounds good," I really don't know what else to say about the G-Boom. I've had this thing for a month and I'm still astounded that it's only $99. 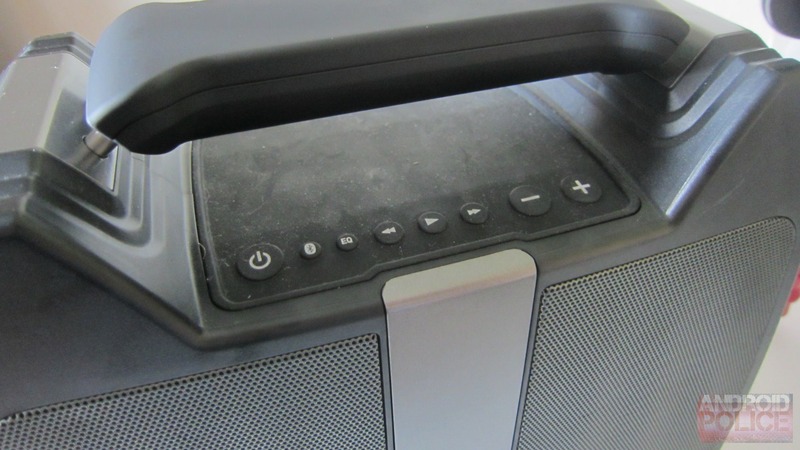 When it comes to selecting a Bluetooth speaker, the sheer amount of choices on the market can be overwhelming. As a result, I get asked which one I recommend on a regular basis, and the first question I usually ask is "how much do you want to spend?" since the price-to-sound quality ratio is an important one to consider. The G-Boom just destroyed that mold, though. From here forward, it will be my first suggestion in the $99 price point (and perhaps even $200+) unless size is a concern, because this is definitely too big to just toss in a bag and go on about your business. In that case, I still readily recommend the UE BOOM. 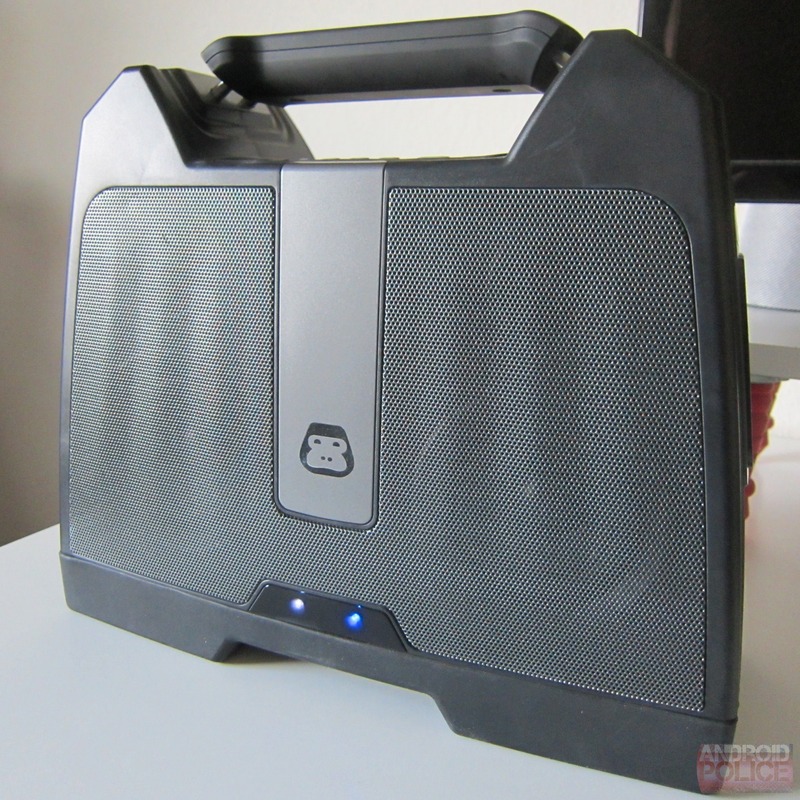 If size isn't a factor or you're just looking for a good Bluetooth boombox, save yourself a lot of trouble (and money) and pick up a G-Boom. You won't be disappointed.